Center for Media Freedom and Responsibility or CMFR has published a review of the local networks' coverage of the 2016 elections. 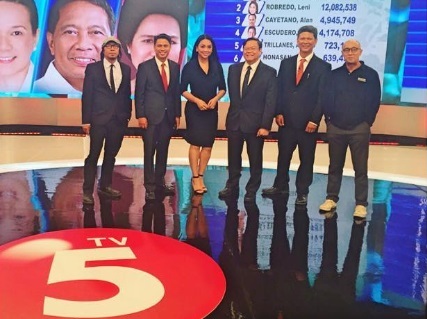 While writing that "most channels enhanced presentations with the standard polish of TV newscasting," TV5's countdown on the night of May 9, for them, was the clear winner. It also noted: "TV5’s innovative efforts to make their coverage stylish and informative. More important, given the quality of vote tracking, the anchors also made it easy to understand." In terms of production value, CMFR also praised the Kapatid Network, writing that it "was way ahead of its rivals."